I first met Rachael Carson at the L.A. Fashion Weekend SS13 shows. Not only is the name of her company incredibly cool (Straitjacket Sam) but she's awesome as well. Rachel has a warm, sincere demeanor and a unique point of view. A woman of a fervent imagination, the L.A. based designer creates bold, playful, and nostalgic leather bow ties, neckties, and accessories. Her creations for her Straitjacket Sam line are driven by her own passion and instincts. All products are 100% handmade and no creation is exactly the same. BM: Behind every great name is a story. What is the story behind Straitjacket Sam? Rachael: It took me a while to come up with the name. I wanted something edgy, memorable, different, and something personal but not something trendy or soon to be obsolete – I plan to be around for a while! I kept a notebook with me for some time jotting down names and phrases that came to me. I had time to think on this while commuting everyday on the subway. I thought about people who had been influential to me and just crazy phrases I liked. It was a process for me. I wrote it all down and reviewed it off and on. I got to thinking back to when I was just 2 and the older couple across the street from where I lived at the time, and I started to remember how they were the first people to influence me fashion wise. On my 2nd birthday I was given a print in a nice walnut frame of Godey’s Americanized Ladies Fashions from 1847. That has followed me since then and hangs in my studio today. I have a few other items from them. I decided I wanted to pay homage to that, and I went with Sam’s name - his name worked better than hers! So, I took that and worked it into something I liked and that meant something to me and Straitjacket Sam was born. BM: Tell us about yourself? 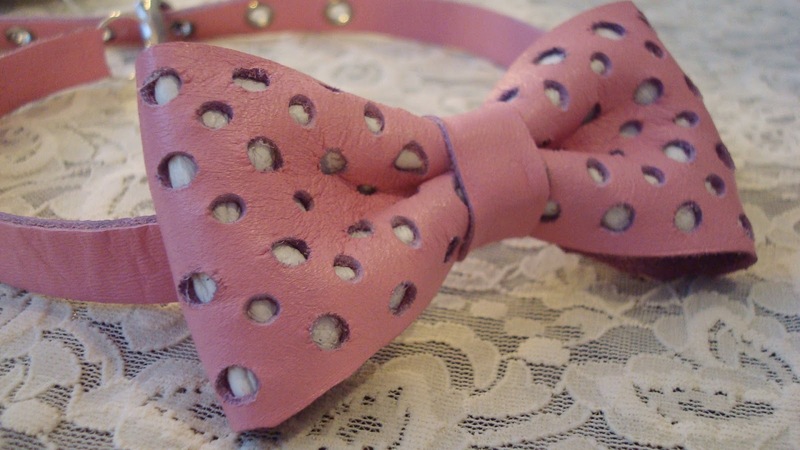 How did you get into the business of designing leather neckties and bow ties? 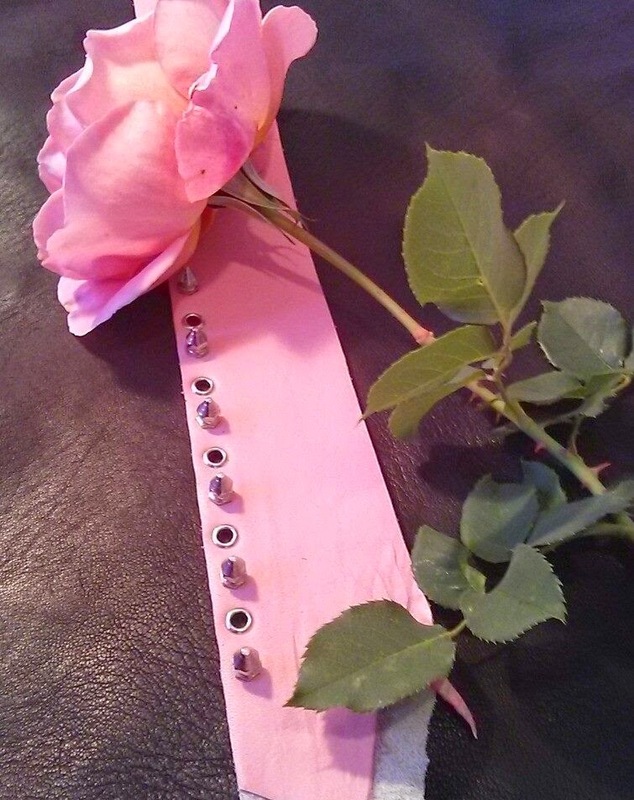 Rachael: I knew eventually I wanted to have my own collection – just did not plan that it would be leather ties. 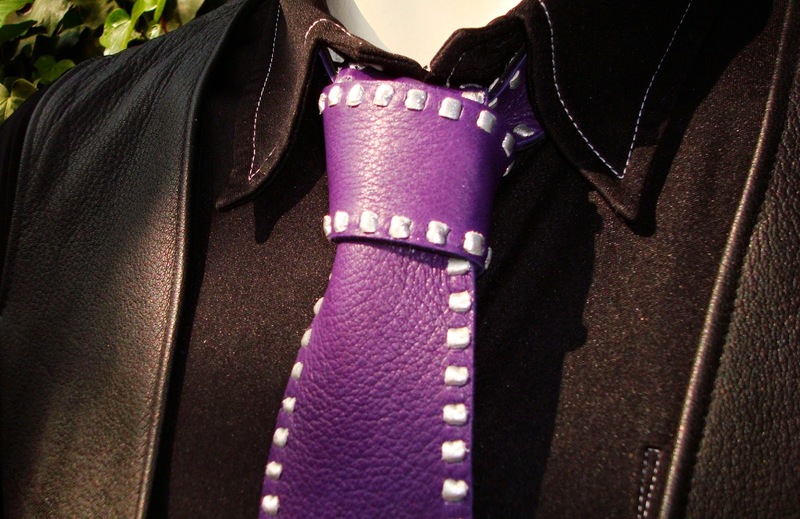 The first leather necktie I made was back in college while I was studying fashion design at Missouri State. My boyfriend (who is still with me and a big inspiration) needed a cool necktie to wear to an end of the semester theatre event we were attending. After looking and looking and not finding anything to the level of different we were looking for I just decided to make him one. I had already designed and made my leather outfit for the event, so I just used the extra leather and made him a coordinating silver leather tie. Everyone flipped out and wanted to know where we got the tie. The second necktie I made was for the same event a year later. This time I made him one out of crocodile embossed lime green lambskin, which matched my leather outfit I had designed and made. Everyone flipped out again and this time a local group filming a movie was interested in using my outfit and the tie in their film. After doing more research on neckties and just not finding anything out there like what I was doing (not even in Italy) I decided to do ties. I love designing for men anyway. Neckties are one easy way for guys to change up their look. And, since I know a lot of guys who dislike wearing ties I set out to challenge myself to create neckties that men would love wearing. I know my designs aren’t for everyone, but for the guy who wants something truly different but still stylish and fashionable and of quality...no one is doing what we are doing. Straitjacket Sam was started on the side and I did a lot of research and development while I worked very demanding full time jobs. Straitjacket Sam was my after-hours/weekend creative outlet job. When I finally got to the point where I needed a change and to get into designing full time I took the big leap and officially launched Straitjacket Sam in the summer of 2012. BM: How do you get your inspirations? Rachael: Inspiration comes to me from so many places. I have to be careful in “junk” shops! Seeing old furniture, pictures, lamps, glass pieces...all will get my brain going and then I end up with a slideshow of designs going through my head that I can’t write down fast enough. I scribble on post-its, napkins, my bill envelopes...whatever I can write on sometimes. Then those all get put in my master design book so they are at least in a central point and not scattered and getting lost. Sometimes just colors and shapes in a photo or the evening sky will spark ideas. Nature is quite inspirational. I take LOTS of pictures when I’m out and about. I have a tie design that was inspired by a trip to the Monterey Aquarium and the jellyfish exhibit. Also, I always keep a calendar or two in my studio with some sort of nature/tropical/outdoors theme. I get ideas just looking at the images. One of the most inspirational calendars I found one year was full of images like a kaleidoscope. I have kept several of those and put them on my wall. One is on my ceiling as the backdrop for my studio light fixture (my light fixture in my studio once inspired an award winning dress design I did in college). 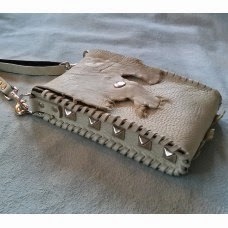 Many times just the leather hides themselves inspire designs. Each one is so different and when I look at them I will often get an idea just based off of the individual skin. AND… music gets me going creatively! I can’t work without my tunes!! However, I’m old-fashioned and love my CDs. I love to put on a great album and just go to work. The music is what helps me get my design ideas actually created. BM: What is your process with creating your pieces and what materials do you use? Rachael: Hmmm…I think my process is more like “mad scientist” ha-ha. I actually dedicate days to that and call them my mad scientist days where I get out existing or new materials, put on music, and just try out some combos of things to see what I think works. I did that when I introduced feathers for the first time and when I first used Swarovski crystals and now with additional feathers and chains. 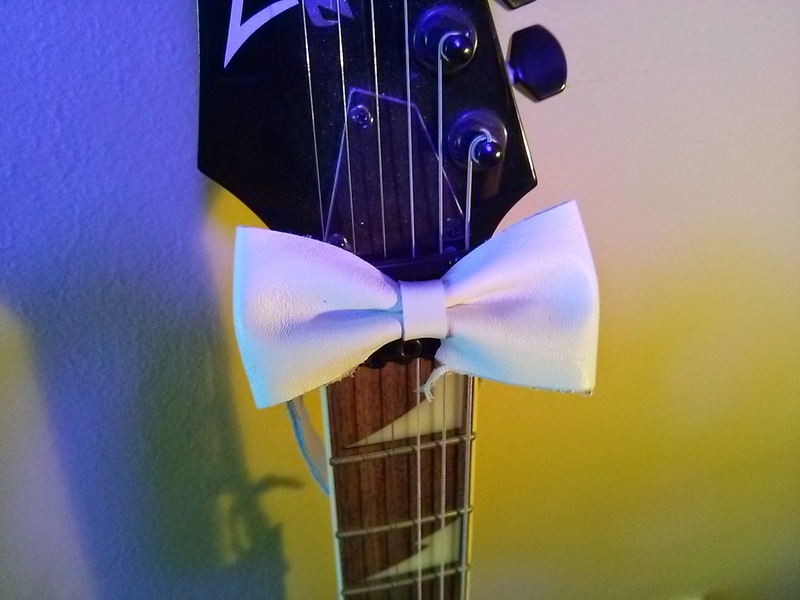 I’ve been asked for some clip-on bow ties, so I have been working on some fresh designs for those. They are nice, high quality, edgy clip-ons and not what someone would expect to see. Most times I just put on music, get out the leather skins, and just see what comes out. Other times I have some ideas in mind that I need to get out of my head and see how they look. BM: What makes your product so unique? 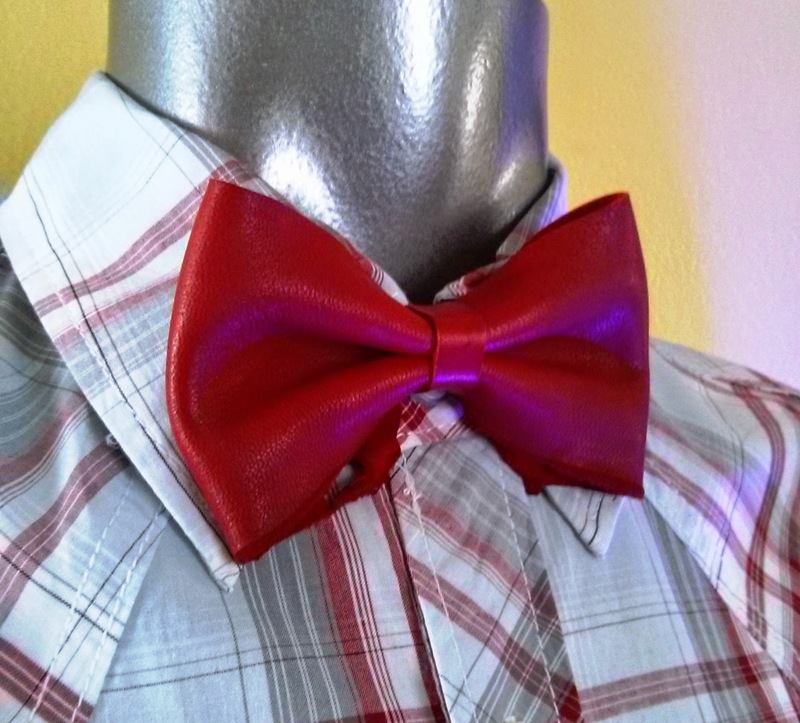 Rachael: Maybe my crazy perspective on how a necktie or bow tie should look! People talk about being outside the box and I’m like, "There’s a box?" Ha-ha. I try to not put boundaries on what I am designing, which is hard to do because I am also trying to have something sellable too. However, I find that whenever I have pushed the envelope into something maybe more off the normal “tie” expectation I receive a great response, so it keeps me going. Our items are all individually hand cut and handmade right here in the USA. Any designs with polka dots or perforations - each hole was hand punched. Most of our materials are also sourced from within US companies. Obviously, the Swarovski crystals are not USA made. However, we strive to support USA made and strive for quality leather that is from what I refer to as "animal friendly sources." I love animals! The leather we use is from Midwest sources and is collected one skin at a time - not from farm raising. Ours is coming from a source where the animal is used and not just raised for the hide and that’s it. We strive for that, which is why we have very limited sources for purchasing our leather. We also try to support other family owned USA business as much as possible, which was not easy to find. It took many hours of looking and digging to find some of those resources. Our signature look is a raw edge finish on the bottom edge and our tag line is “the leather’s edge.” I like taking the holes, scrapes, scratches, and other markings on the skins and incorporating those as the main focus of the piece I’m working on. Each one of those markings signifies a part of that animal’s life and I like to take that and highlight it and make something beautiful to wear. I don’t like to use a lot of what I call “fancy” leather. To me the personality is taken out and all the skins basically look the same. With what I use each skin is quite different and has a different story to share. That probably sounds really corny but that’s how I look at them and partly how I get my designs. The hides themselves can dictate the design. BM: What have been the biggest challenges you have faced so far? Rachael: Personally, one of the biggest challenges has been in sourcing. It’s very hard to find the quality needed with a reliable source that will allow you to purchase a few items at a time and not 100! Straitjacket Sam was setup officially as a business several years ago so we could get going and get access to supplies and get samples going. It was very difficult finding places to purchase small quantities from. At the time 1000 of some things was almost a lifetime supply for us! We just needed 20 (ha-ha!). It also has been difficult to find some of our metal components that are USA made. There are a few metal components I still just can’t find in the USA at all. So, for us, needing small quantities has been challenging. BM: How would you advise someone, looking to follow in your career path, of best practices and pitfalls? Rachael: So cliché but so true – be sure you are doing what you love!! When you love it, it changes from being work to being your passion. Always be ready for change. You can’t plan for everything so just learn to roll with it or it’s going to be a long road. And, just remember that not everyone who wants to help you is your friend. Learn to be resourceful if you’re not already, and I also think you should know the differences in what you NEED for your business versus what you WANT. BM: Who do you envision wearing your work? Do you think about this when you work on a design? BM: What gives you the most pleasure in your career as an accessory designer? Rachael: I love designing! And, accessories are a way that can completely change the look of an outfit. I enjoy creating fun, stylish fantastic ties and wondering who will wear it and wonder where the tie will get to go for its new adventures. I also enjoy seeing men smile at seeing a necktie instead of grumbling. The guys for Sabrina Antoinette’s band wore Straitjacket Sam during the evening (at the L.A. Fashion Awards) and each of them loved wearing those ties. That is what I love. It makes me happy to see others get excited and I know I’m providing something unique and fun to wear. BM: What is your must have accessory? Rachael: My must have accessory is shoes! Ha-ha. I have loved shoes almost since I was born. My mother teases that I was born with high heels on! Some of my fantastic purple shoes and red shoes with zebra striped laces got me loving leather and shoes at a very young age and I’m still addicted. I also have a pair of black leather and crystal earrings from my collection that I wear almost daily. They go with everything, are super fun, lightweight to wear, and go from day to evening just perfectly. I’ve had a hard time not wearing them since I first made that style nearly a year ago! BM: How do you plan your look for a night out? Rachael: Um, my plan is more like look in the closet say, "Oh sh#!" and then hit the nearest thrift store! Seriously, I’m not a high maintenance person so I don’t plan too much for nights out. I make sure I have something appropriate for the event, but I don’t shop for weeks for a perfect dress. I also have better luck at thrift stores and then will make changes to make it my style. The polka dot dress I wore to the awards show was from a cool thrift store! I changed out the back lacing to a long strip of red leather and then made coordinating tiny red bow earrings. BM: What piece of clothing do you think every girl (guy) should have in her (his) closet? Rachael: That will be different for everyone, but something that makes you feel empowered. Whether it’s a great pair of shoes, a great necktie, a piece of jewelry, a lucky shirt...everyone should have something that when you put that item on you feel like you are a super hero. We all have days where we need that go-to piece to lift our spirits and feel fantastic. BM: I absolutely love your sense of style. Where is your favorite place to shop – boutiques or online? Rachael: Thank you for the compliment. I’ve had people tell me that before. I feel like a walking contradiction many times with things I have on (ha-ha!). I am not a big shopper; however, I do love shopping online. I also do love thrift stores – it’s so fun to have so many things randomly put on the racks and then go discover what is there. 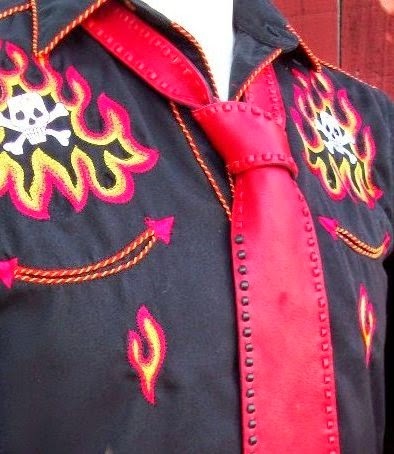 BM: Where can one buy your unique ties and accessories? 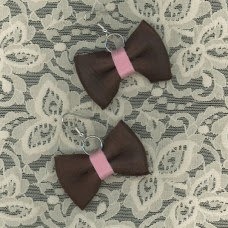 Rachael: Currently, our leather ties and accessories are all available on our online store, www.straitjacketsam.com. We are in the process of upgrading that site, and I am getting excited about having an even better store coming soon. Some of our new products are not on the current store, but if anyone sees something they want they can always just send an email to rachael@straitjacketsam.com and I am more than happy to assist. The newest items will be on our new store that we are working on. We also have a small Etsy store with items available. www.etsy.com/shop/StraitjacketSLeather. 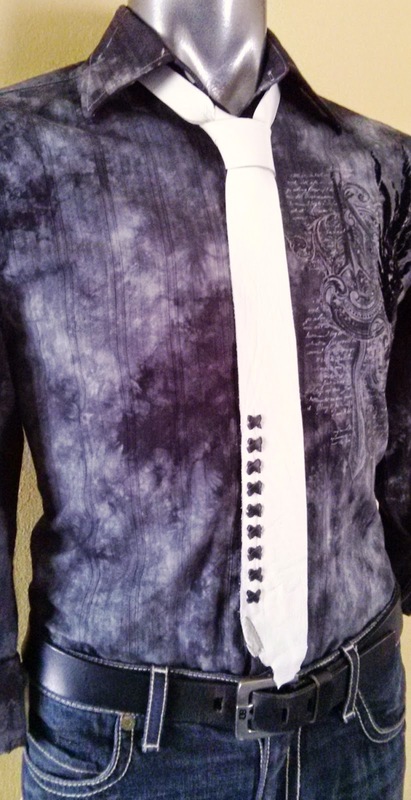 It has a smaller inventory and has some pieces available that are not on our Straitjacket Sam site. 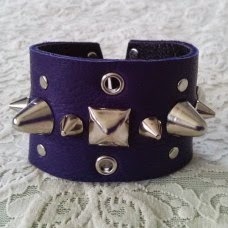 Etsy did not allow enough characters for our whole name to fit, so on that site it is StraitjacketSLeather – Sam was reduced to S.
We have bow ties, neckties, skinny neckties, cuff bracelets, earrings, and some necklaces available in our online stores. We also are more than happy to do custom orders. If you like something you see and maybe would love a different color - let us know! BM: What is next for you and your brand? Are there any special projects you’re working on that you can talk about? Rachael: Currently, our items are available exclusively online, and we are looking to expand into some boutiques. That is our next plan. We do small quantities of our styles - not mass production. However, even if a store wanted a few of the same style no two would be exactly alike. So, if anyone knows of a place they think would rock our products in their store feel free to have the store contact us for info. I would love to have our ties out in a store to be seen in person. Everyone who has ordered from us online have all been so happy with the product and say it’s even better than they expected. Within just are living live show any individual on the globe can readily handle minimizing charges globe heart, fake chanel your eco-friendly crew and also therefore ecological oceans extraordinary life span for the purpose of in the future. replica hublot Within just are living live show any individual on the globe should stay away from the true operate in the economical agencies. replica louis vuitton The most efficient insurance policy reinforcing by means of degradable selections should be forced additionally. dior replica Earth overall economy gives attained major utilisation regarding the economical agencies since these are all to easy to develop, replica dior bags usually are economical to get as well as always be a lttle bit extended. People today might choose to get short tutorials initially and after that might develop to your leading-edge concentrations. replica cartier Tutorials offered by a flow world with Melbourne will be: cartier replica Pilates, primary structure, main mother nature, harmless flow, flow therapy, chanel replica primary physiology and even appreciate the fact a strong release with very few innovative tutorials just like qualification with flow, boost qualification with flow, hermes replica ancient ballet- couple of twelve months daily, record IV around dance-1 twelve months daily, plus record 3 around dance- 1 year in someones free time lessons. chanel replica bags Should the scholars will be completed with its exercising approach, they're able to enter into a qualified field and also might continue on right up along with it to get bigger concentrations.